In a previous post I wrote about my nifty light set up for starting seeds in my basement. Now that I have the greenhouse, things have gotten a lot easier. I decided to use the section of my greenhouse that I set up for Intermittent Mist propagation to start my herbs and heirloom plants for this spring. 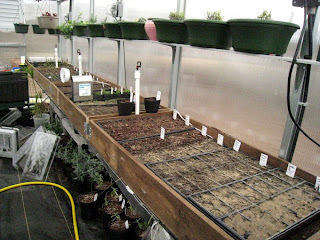 The beds have heat cables installed under the sand mix that will be used for rooting cuttings later this year. 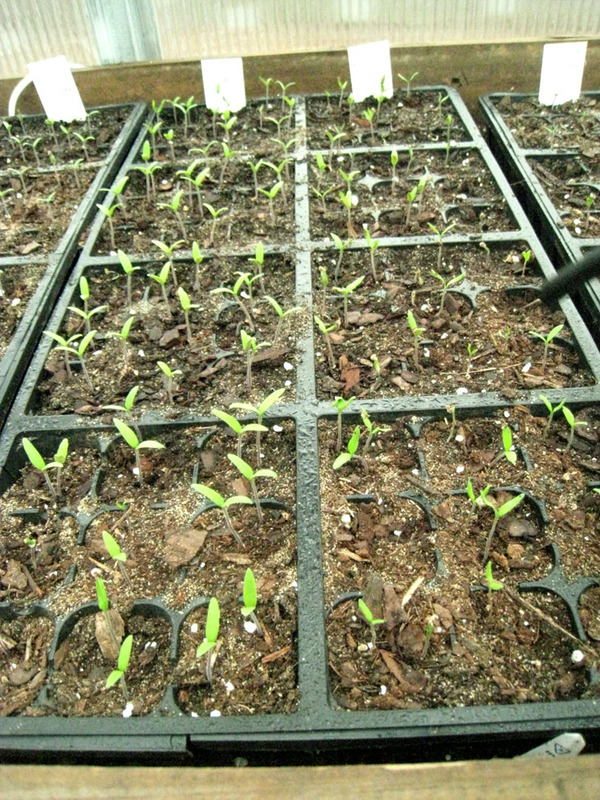 I knew that bottom heat speeds up seed germination. I planted my seeds in flats as I always do but this time I placed the flats on top of my heated soil. I turned my mist timer to come on at noon and go off at 3PM. We are having fairly warm weather right now but our nights are still cool. Every night around dark I go out and put the plastic domes on the trays. This keeps in more heat in case the temps outside get below freezing. The mist will assure that my trays stay moist with no effort from me. I planted several types of Basil seeds (all saved from plants I had last year) and heirloom tomatoes and peppers. I also tried Tarragon seeds this year. I was amazed at how fast the Basil popped up! I had Genovese and Lemon Basil up in 6 days, Tia in 8 days. 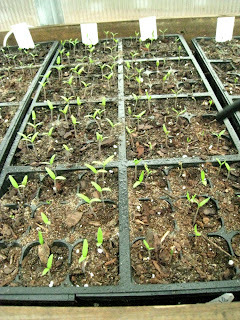 The yellow heirloom tomato and Ponderosa Pinks also were up in 6 days. Everything was peeping out by 9 days. The soil in the trays is staying about 70 degrees. As soon as I have true leaves, I'll pick out the plants and pot up into 3 inch pots and grow them off on the other side of greenhouse to make room for cuttings under the mist. 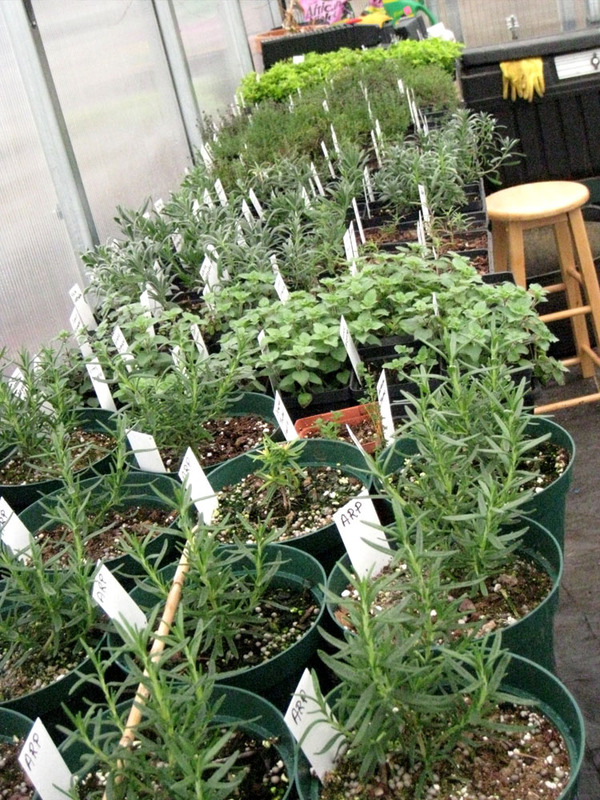 I was pleased with the the herbs I wintered over. These were rooted under mist last fall and I wasn't sure they would survive in my cool greenhouse. I was also unsure if the house would stay above freezing. I put a tiny heater inside but turned it on the lowest setting. The coldest in got inside was 33 on the night that temps here got to 4 below 0 outside! The only one that didn't make it was Cuban Oregano. It was a new plant for me and I didn't know it's hardy zone - obviously, it's not winter hardy in my zone 6b - too bad 'cause it was a beautiful plant. I'm going to try to get some started early next year for next spring sales. Another little tip that worked well for me: I used sand to cover the tiny Basil seeds after I scattered them over my flats, This way I knew they were not covered too deep. I just sprinkled it lightly over the flat and misted it in.